All the official news of the composer Hetoreyn. Hetoreyn - 21st century Symphonist. 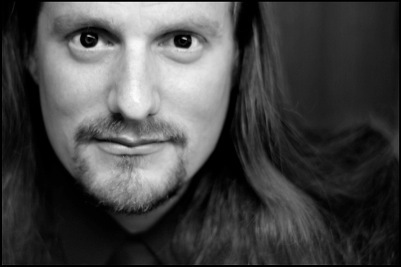 Hetoreyn is a composer of orchestral music. Recently, he has been involved in many film, TV and Internet productions around the world, and he has published eight albums, with a new symphony currently in progress. Additionally, Hetoreyn is a sound engineer, orchestrator and host of a podcast show on the Vienna Symphonic Library. Residing in Canada, Hetoreyn's music has been aired by classical radio stations and Internet radio around the world. Listen to Hetoreyn's music demo using this player. (Please allow a moment for the player to appear below). Starship Farragut: The Price of Anything - New Album! 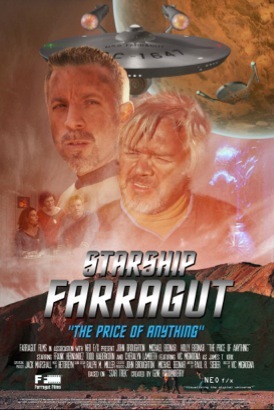 "Starship Farragut: The Price of Anything" OST is now on sale on the iTunes music store and CD Baby. A limited edition numbered CD version will also be available shortly. Please take a look on either iTunes or CD Baby to listen to demos or to purchase the album. Hetoreyn once again performs music for the renowned sci-fi web series "Starship Farragut", this time with their 3rd major episode entitled "The Price of Anything". Performed with exceptional skill and grace using the equally renowned Vienna Instruments Hetoreyn crafts a dynamic score that ensures the audio experience nothing less than a roller-coaster ride for the listener. Digital Download available from iTunes: CLICK HERE! "A Peace of the Storm", a new music video for Hetoreyn's "Winds of Time" symphony now available to watch in HD. More videos are currently in production from Hetoreyn's music and we will post them here very soon. In the meantime please enjoy this relaxing look at beautiful 'Lynn Valley' in Hetoreyn's home region, British Columbia. In other news Hetoreyn has just finished his music score for Starship Farragut's "The Price of Anything and this will be up for sale on the iTunes store very shortly and in time for the end of 2012. Stay tuned for updates on the new Farragut episode as well as Hetoreyn's latest projects including "End of Line", "Ibalter: Symphony of Ahd'ar'ohk", and "WarpCoil X". The new episode is a huge leap forward in quality of production and story telling that will leave you instant fans of this fast growing web show. 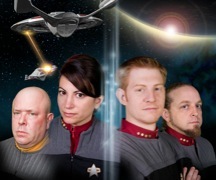 This new episode will be available to watch for free either from the website www.starshipfarragut.com, or on youtube. The soundtrack will be published in the next few weeks and pricing will vary according to your favourite digital music stores. Info will be posted shortly on the album and it's contents. See below to listen to the "Radio Edit" versions of the End of Line - EP album. After a long period of composing and mixing, Hetoreyn's exciting new progressive trance project "End of Line" is finally available to buy as an EP from the iTunes Music store and CD Baby. This new project is a blend of Electronica, Symphony, Metal and Progressive Trance. Dramatic, deep and high energy. This is a prelude to a much bigger album coming early next year, and is just a taste of what is to come. - Tales of the Thorns - A new symphonic adventure. This album represents Hetoreyn's latest efforts in dramatic symphonic adventure. Arranged as a musical story this album tells an epic tale of the 'Vile Thorns', an RP (role play) guild of rogues. Designed as a perfect musical companion to play online games and to RP with. Take a look at the demos available from CDbaby and iTunes. Available now on iTunes and many other digital music stores. Also available from CDbaby.com Please head to the 'Tales of the Thorn' page to find out more. - Hetoreyn’s new album ‘Winds of Time (Symphony No.1)' is now completed and is in the process of being made ready for publication. This album marks yet another landmark in Hetoreyn’s composition. A blend of symphony and film score style music delivering a lush, fantasy world of colour, vibrance and beauty. Hetoreyn has also just begun the process of scoring the new Hidden Frontier film ‘Star Trek Odyssey - Tossed upon the shore’. A none profit fan film. This will be the final chapter in the Odyssey, Helena and Federation One series, all wrapped up in this epic 2 hour film. The movie will be free for download upon release and is expected soon. Today we announce the 'Sound of Life' project. This is a project where data from DNA sequences (the genes that make up living things) are translated, through a method that Hetoreyn has developed, into music. Selected DNA patterns will be played as symphonic pieces. The results of the first piece (Human DNA) can only be described as Mysterious, Eerie, Haunting, and Beautiful. A section of this piece can be heard on the 'Sound of life' tab. In other news Hetoreyns' latest album 'Winds of Time' is in full swing and we have hopes to release the album this summer. Hetoreyn scores new Star Trek: Osiris fan film episode entitled 'Eclipse Part II'. In this 'DS9/Voyager era' show we follow the political intrigue of the United Federation of Planets as a rogue organization plots to take over the alpha quadrant from the very office of the presidency. Captain Bale and his crew are forced to take sides as the battle for dominance begins. The episode runs at 58 minutes in length and can be found at: STOsiris.Com The film can be downloaded for free from there. If you want to hear some of the music from the film then head along to the Osiris page. New album finished and available. The Celstial Compositions album is now completed and I'm beginning the process of registering it with CD Baby. It should be up very soon so you will be able to purchase the album either on CD, or by MP3 download. This album contains most of the music I've made since 2008 and covers 4 different fan films, plus two other inde' films. I have updated the album page with some demos of the music that is on the album. Go to the Celestial Compositions page. Hard copy priced at $ (US) 16.00 from CD Baby.com. Also available on iTunes. If you want to hear some of the music from the film then head along to the Dark Armada page. I've also just finished some music for 'The Light works' which have been working on the opening video for "FedCon 18" which is Europes biggest Sci-fi Convention. The video, needless to say, features Tobias Richters amazing digital model of the new Enterprise from JJ Abrams movie, and is available to watch online. After a lot of work I'm final able to sit down and being working in earnest on my third album. Also I'm going to be starting up the VSL podcast again very soon. I've had some set backs with equipment shortages and time constraints but now I find myself able to resume the show, so listeners of the podcast .. stay tuned. In the meantime I've released two tracks from my recent score of the Star Trek Fan film series "Helena Chronicles". So if you head over to the Helena Page you can listen to what I've been up to.